Who knew this would be so good! 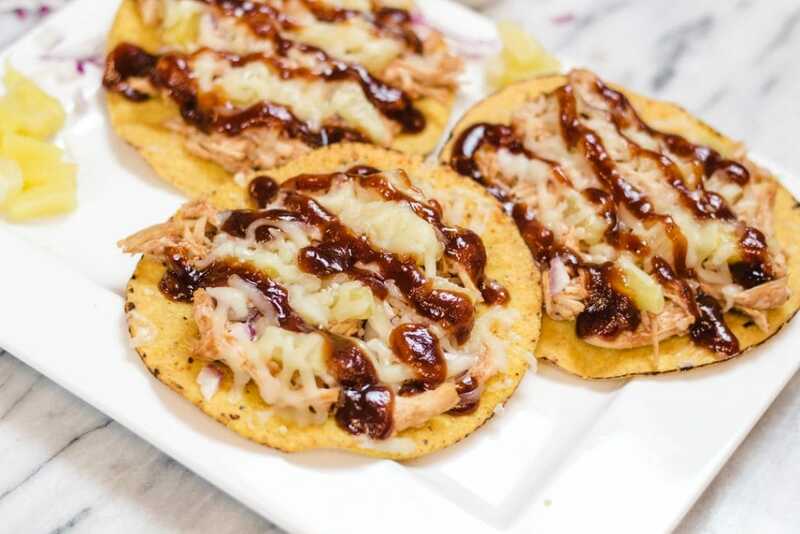 BBQ Chicken Tostada with Red Onion & Pineapple is a great appetizer or main course, make sure to make extra. It’s that good! I am obsessed with BBQ Chicken, but not just plain BBQ Chicken, I want more! I want garlic, and red onion and the sweet juicy pineapple too. It’s my favorite Pizza whenever I order, and I love to bake up a good BBQ Chicken Breast too. The combination of the Red Onion with the sauce does it for me every time. Another Family favorite is the Mandarin Chicken recipe, which is more of a dump and go style recipe that can be made in the Instant Pot or Crock Pot. Oh that is delicious too! I won’t lie, I make these BBQ Chicken Tostadas and it’s a rush to get some because they get eaten up so quickly. So I’ve learned my lesson and now make double. And they still all disappear! Skip making the chicken and buy a rotisserie chicken and piece it up. It’s a quick time saving hack and you won’t be disappointed! 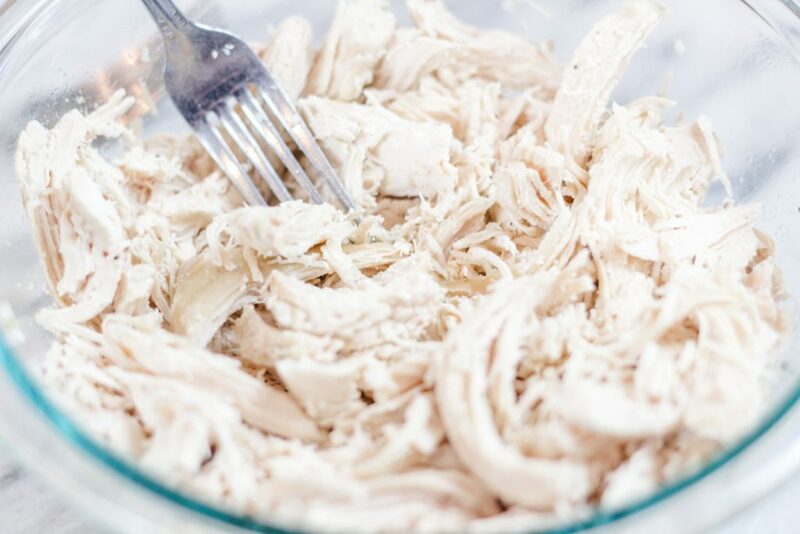 It’s super quick and easy to make shredded chicken in your Instant Pot or Pressure cooker. Add your chicken breasts, salt, pepper, and of course garlic and set to 15 minutes High Pressure with a 15 minute natural release. 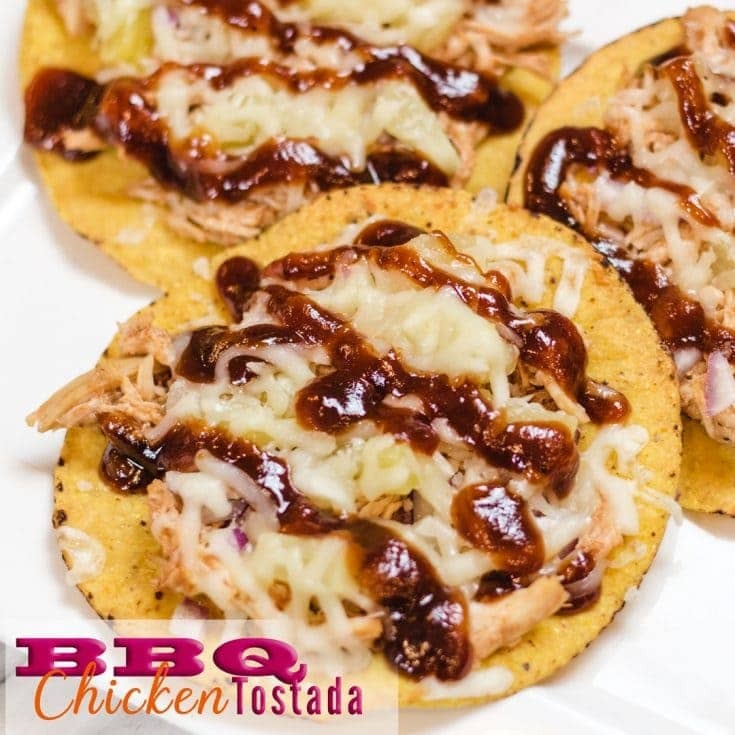 Your chicken breasts will shred easily and be ready for these amazing BBQ Chicken Tostadas. Don’t forget to add a cup of water or broth to the bottom so your Instant Pot will pressure up! 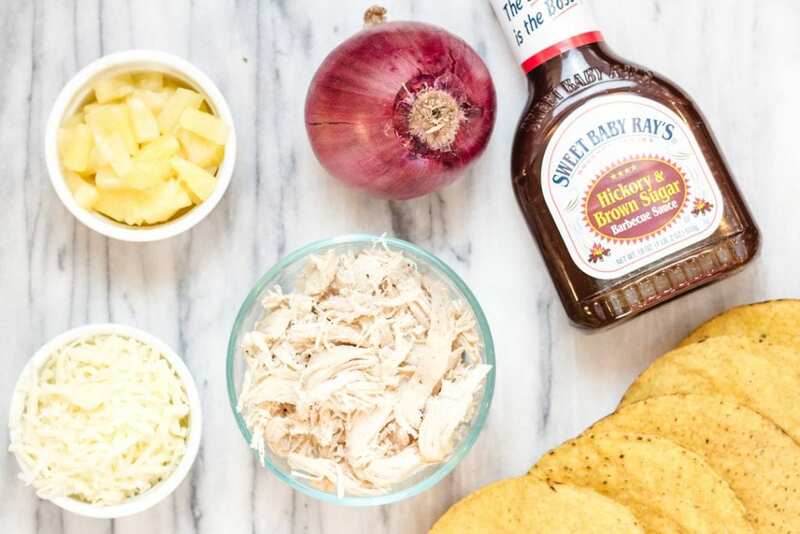 Making a Chicken Tostada is easy. Even the little hands in your house can help with this recipe. Let them build their own and you might be surprised how quickly they eat it up! Place toppings of chicken, red onion and Pineapple on top and sprinkle with cheese. Then Bake to melt cheese and seal the deal on this MVP Recipe! 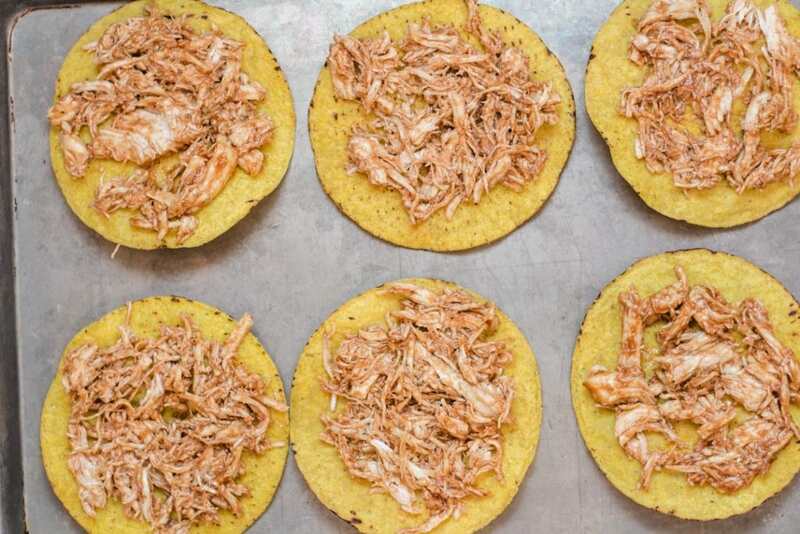 A Tostada is simply a crispy flat corn tortilla shell. You can buy them and they look just like a large flat corn chip, or you can fry them up yourselves in oil. Either way it’s a fun Mexican tradition in your meal planning. 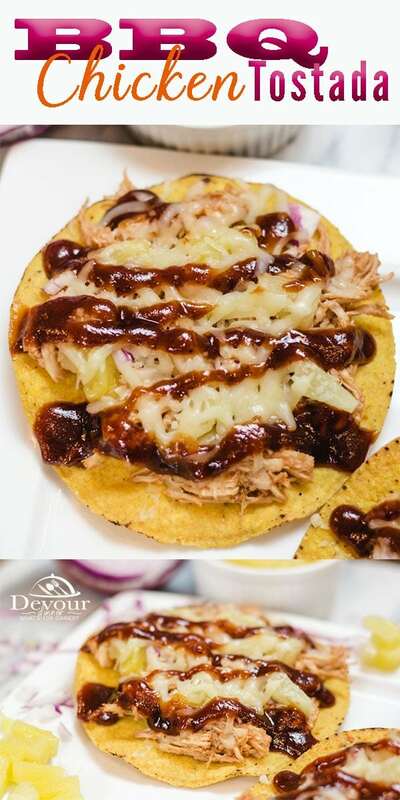 To make a home made Tostada shell, heat up oil in a frying pan. 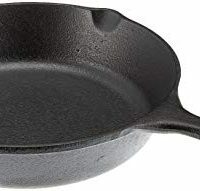 I prefer to use a Cast Iron Skillet using a Canola or Vegetable Oil. Heat the oil until hot and place one tortilla into the hot oil for about 30-40 seconds and flip using tongs. Then let it fry for about 30 seconds more. The tortilla should sizzle. I like to use a medium high heat (7-8) on my gas stove. Pull your now crispy tortilla out of the hot oil using tongs and place on paper towels. This will help absorb some of that extra oil and allow the shells to firm up. 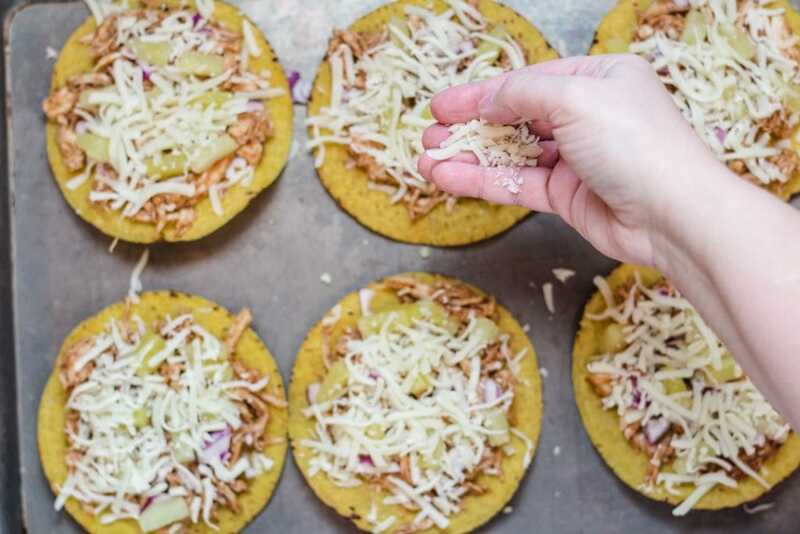 Within minutes they are ready to use as a Tostada Shell and place your toppings on! What are your favorite toppings? We have loved BBQ Chicken topped off with Red Onion and Pineapple tidbits. 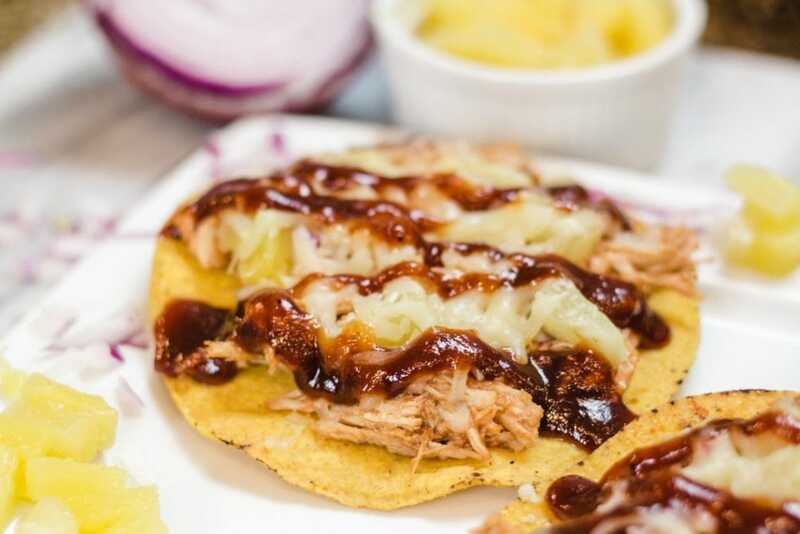 A Mexican blended cheese is also ideal for this recipe and a drizzle of more BBQ Sauce on top. Trust me, add the Pineapple. It’s delicious! We all love a nice 2 bite appetizer, but let’s be real. Sometimes you need a bit more. 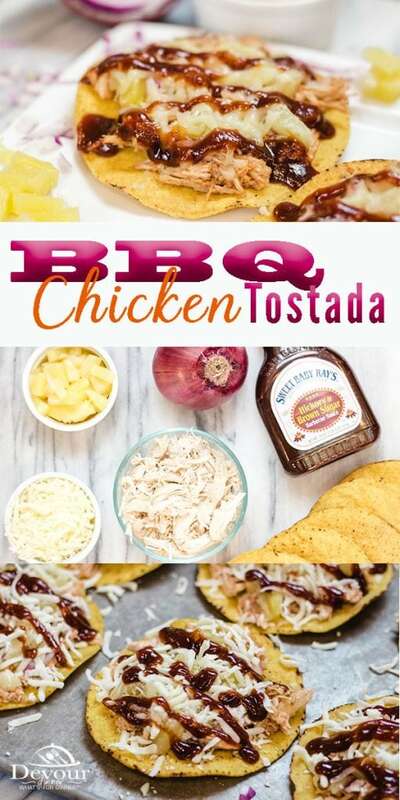 I have found with my boys that this recipe for BBQ Chicken Tostada is a WINNER! In fact, my boys voted this recipe MVP of the Super Bowl Party we had. They were inhaled well before the 1st quarter was over and I was asked to make more. Thank goodness for the Instant Pot, making shedded chicken is a breeze. And more were ready to be well before half time. 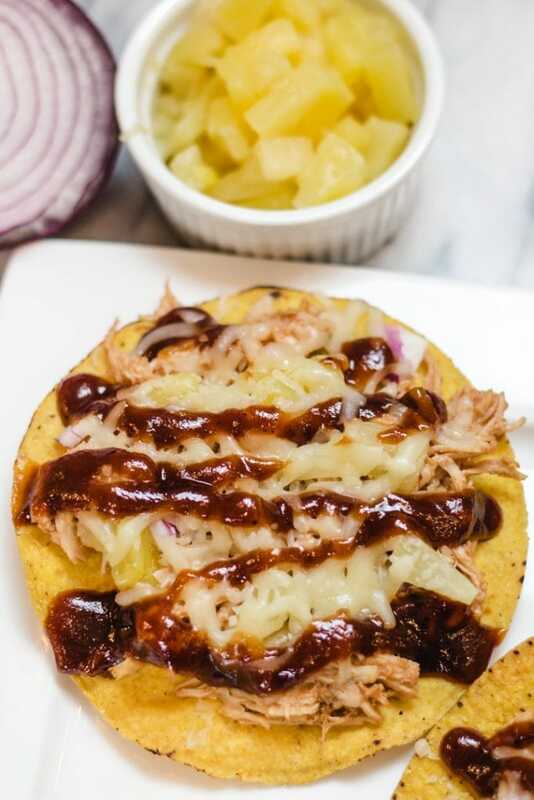 Sweet and Tangy BBQ Chicken Tostada with Red Onion and Pineapple will WOW your Tastebuds. Family Voted MVP Recipe. A Quick and Easy meal. add Salt and Pepper and 1 Tbs crushed garlic. Set to Manual High/Pressure Cook for 15 minutes with a 15 minute natural release. 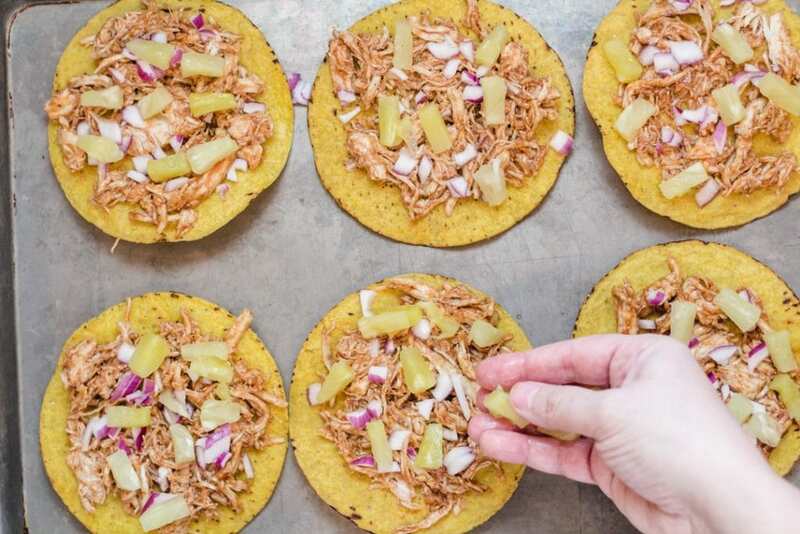 On a Cookie Sheet lay out 6 pre-packaged tostada shells. 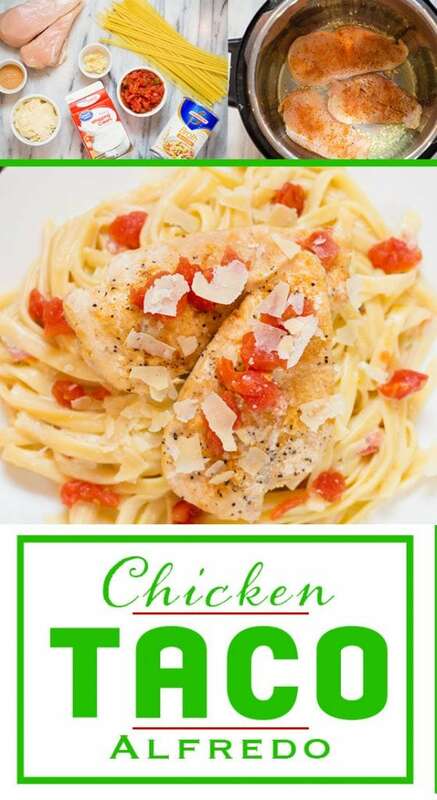 Use Rotisserie Chicken and piece up in this recipe. It's a huge time saver! 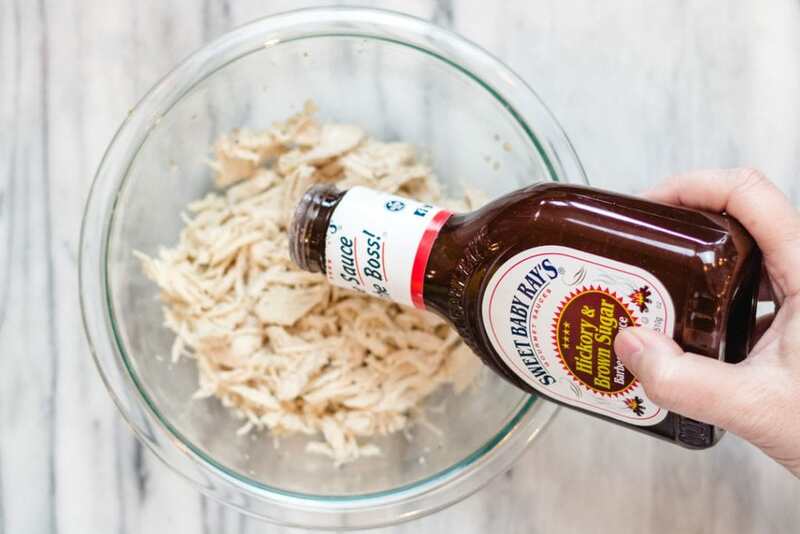 Make Shredded Chicken and freeze for later. 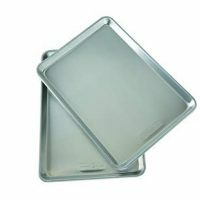 Then pull out an let thaw and use for this recipe! Looks so yummy and tasty. As long as it has pineapple and BBQ I’m in. Looks amazing! 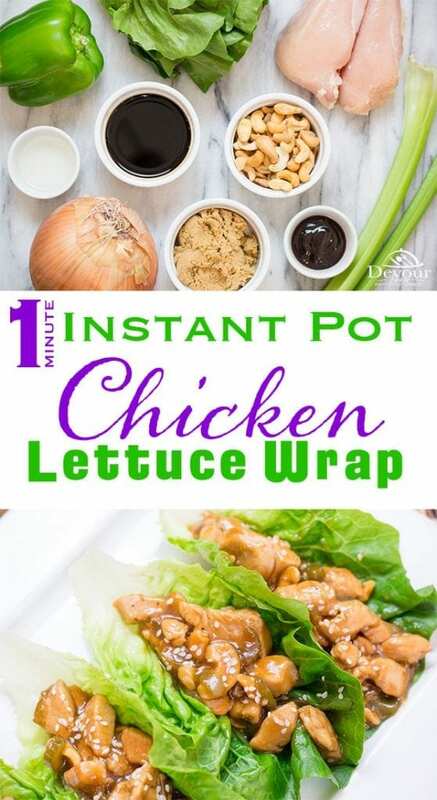 And I’m always looking for ways to use my instant pot! This looks amazing! Such a fun and simple dinner. I’m a little bit obsessed with BBQ Chicken pizza and I can’t wait to make this. BOOKMARKED an on the menu plan to try next week! This looks so good and something I believe my ENTIRE family will enjoy! Thanks for sharing! Not that I need the excuse, but today happens to be Tuesday – looks like I will have Tostada Tuesday tonight 😉 YUM! I wouldn’t have thought to add pineapple, but I am going to try this. It looks delicious! This is so creative and looks incredible. I love how you combined BBQ and pineapple. These look so good! I will have to try them soon. My daughter, especially, would love them! I am a recent convert to using pineapple in all sorts of ways. I used to think I didn’t like it because I’m not a fan of canned but fresh grilled is just right for me! This looks really delicious. 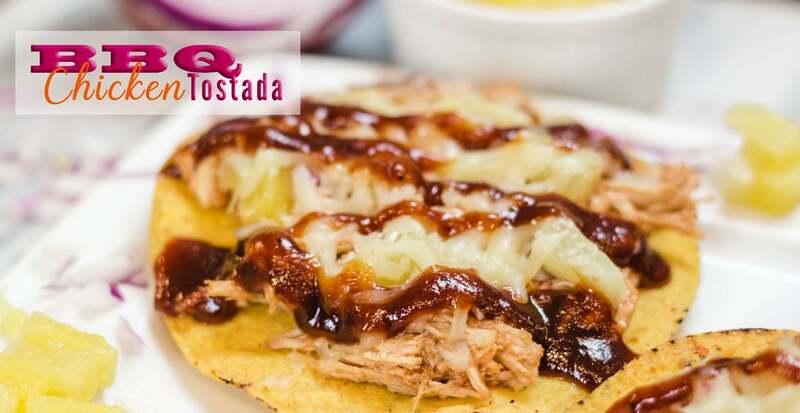 I love tostadas! This looks tasty! Going to have to try! That’s a family favorite BBQ sauce! (Spicy). Looked easy and love the idea with pineapple! Sweet and savory mix! Yummy! Kids will love too! I’m usually not fond of pineapples in recipes, but this one looks delicious. I think the flavors will blend nicely together! Yum these look delish! My hubby is a huge bbq sauce fan. We will have to try these!